How do you describe an album that crosses musical boundaries and provides socially conscious lyrics, all while sonically tracing the African Diaspora from the past to present as a way to express one’s identity? Words like ‘cutting-edge’ and ‘innovative’ come to mind, but perhaps ‘thought-provoking’ best captures the mission of saxophonist Marcus Strickland’s latest release, People of the Sun. From the percussive sounds of the Batá drums and djembe on “Lullaby,” to the Fela Kuti influenced groove on “Aim High,” to tracks that combine funk, hip-hop, neo soul, and jazz influences, Strickland provides many sonic qualities that resonate within the African Diaspora. He takes his explorations a step further by addressing topics dealing with black experiences, black life, and black communities. Strickland accomplishes this with musical examples of love and blackness. For example, Strickland is joined by Bilal, Pharoahe Monch and Greg Tate on the song “On My Mind,” which explores the romantic side of love as well as its essence and nurturing force. Later, on “Black Love,” Strickland searches for a definition of love through conversations with his parents and friends. According to him, black love, while unconditional, is “transferred to your community. To preserve it, you have to think of your people as one instead of thinking of just yourself.” In other words, black love is manifested through the relationship between the individual and his or her community. Switching from love to social awareness, Strickland’s composition “Cloaked in Controversy” draws our attention to the racial inequality and injustice experienced by black men in our society. Police sirens are heard throughout the song as two women “remind black men about the bodily dangers lurking outside their doors.” As a response to the anxiety and concerns expressed by both women, “Marvelous,” sung by vocalist Akie Bermiss, acknowledges and honors black women, reminding them that they are a black man’s “rock in a chaotic world.” Here Strickland not only emphasizes the strong ties between black men and women, but accentuates how black love serves as a foundational force within the black community. 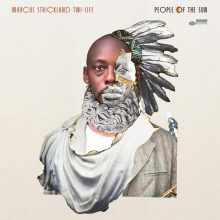 People of the Sun is certainly an expression of Strickland’s identity as he presents his perspective of black life. Musically sound, artistically invigorating, and community conscious. Definitely, a must buy! This entry was posted in Jazz and tagged blue note, CD review, Jamaal Baptiste, Jazz, Marcus Strickland Twi-Life, People of the Sun by aaamc. Bookmark the permalink.